So you are a runner, maybe you like to run around the block or you like to run marathons for the fun of it or maybe you are a professional athlete. The important thing to remember whenever you train in anaerobic or aerobic sports is that you need to keep yourself safe from injuries. If you are training alone without supervision you should definitely focus on strengthening other parts of your body except those that you use while running. In this post, I will introduce to you two yoga runners video that I did and I would like to share my experience with you. Before I get into the yoga runners video lessons that I did, I would like to tell you a little bit about myself. I used to compete in Triathlon and I would train 6 days a week with a group and also alone. For those of you who aren’t familiar with Triathlon, it is a sport where you begin with swimming followed by cycling and running. I used to see many people get injured while training because of a variety of reasons, some of them wanted to prove that they could do more and better, some didn’t listen to the coach and some didn’t do the simple stretch that we would all do before and after every training. I can’t tell you enough how important it is to take care of your body after your running session. Running is a monotonous motion of the body, we repeat the same movement again and again while we run and this can cause various injuries with the knees, hip flexors, hamstring, and shoulders. When you stretch before and after running you are improving your flexibility and range of motion for many parts of your body, yoga can offer many poses that you can do in order to keep your body healthy while improving your running performance. I enjoyed this practice very much, it was very easy to follow and I would definitely say that this is a good lesson for beginners. So if you are only beginning to discover the world of yoga you can try this lesson and move from pose to pose while feeling a good stretch, without overdoing it with complicated poses. If you are a runner and you just finished your daily run, try adding this at the end of your training instead of the normal stretches you do, see if this flow between each position feels better than the regular static stretching that you probably do after your run. Moving between each yoga pose creates a great flow in the body, while also focusing on the breath I felt this lesson was built with much thought for athletes and runners. One of the poses was the Pigeon Pose, which is a great pose that creates flexibility and strength in the hips, and it is very important to work on hip openers especially if you run a lot because your hips tend to tighten up. Even if you are not a triathlete you can do this lesson, I love the fact that both of these lessons are only 30 minutes so I can add this at the end of my run as relaxation or stretch time. Both of these yoga lessons were just right for what I was expecting, without any difficult or complicated poses. It was easy to follow and because it was only 30 minutes I know that I should really give my attention to every pose to get the best out of it. Sometimes I don’t have a time for a full 60-minute yoga lesson, so yoga exercises like these two are perfect for the times I really want to practice yoga but I just can’t find a spare hour. If you are looking for something not long but effective I would recommend trying one of these lessons or even both of them. If you are a beginner and you are looking for a full course then you can see this review I did about Ashtanga Beginners Online Course. 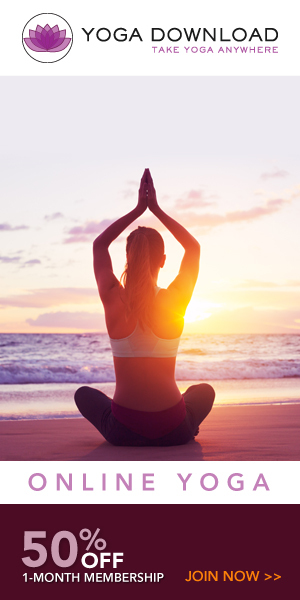 Do You Think Yoga Can Help You After Running? I would love to know if you think that yoga exercises can help you prevent injuries? Please leave your comment below and I will be happy to reply. If you found this interesting then read more about Health Benefits of Yoga – Based on Research and What is Yoga Good For. Thanks for the great post. In my years massaging athletes, I can’t tell you how many times I prescribed the pigeon pose for runners. I can also say that the difference between runners (especially those who’ve been running 20, 30, 40 years) who stretch or do yoga, and those who do not, is unbelievable. The texture of the tissue gets so different over time and years into running. Yoga, in my view, is great as a standalone fitness strategy but crucial as a support practice for runners. Wow, it’s wonderful to hear your experience working with athletes that have been practicing yoga and those who haven’t. I also think that yoga is an important support practice for runners.